The manufacturing industry has had a reputation for being late on technology adoption ever since the steam engines brought the first industrial revolution forward. Even today, while the consumer market has seen the likes of Uber, NeXT, and Spotify leverage latest technologies like Big Data, machine learning, and sentiment analysis to provide products with cutting-edge technology, the manufacturing industry is several steps behind. Even among the manufacturers who are ahead in the technology adoption curve, a good percentage of them have had trouble scaling pilot projects into financially successful projects across the organization. A manufacturing execution system (MES) provider LNS Research spoke to supports this - they have no trouble selling pilot programs, but fall substantially short when it comes to anything beyond that. Why are these companies having trouble in scaling such projects? The answer is identifying business cases. Identifying business cases for the next-gen digital technology is one of the top challenges faced by manufacturers on their Industrial Transformation journey. Several Industrial Internet of Things (IIoT) software vendors have briefed LNS over the past few years, and while each of them has their own Industrial Transformation story, what’s common among them is that each IIoT solution enables companies to gain access to data and convert that data into meaningful insights and drive decisions. LNS recommends companies to identify the decisions they will need to make to achieve their strategic objectives, and then come up with use cases that help them get there. With that perspective, here are some use cases that enable converting data to decisions. Inexpensive sensors, almost unlimited computing power, and cloud and Edge computing have allowed today’s line builders, systems integrators, and OEM providers to provide smart assets to their industrial customers. These devices can transmit real-time condition data that IIoT technologies can monitor for a proactive condition-based maintenance approach. Companies can also use this data to analyze trends over time and identify patterns in their assets, thereby solving operational challenges through predictive and prescriptive analytics. For instance, a manufacturer started analyzing data from their motors and pumps in their bottling operation shop floor. The analysis enabled them to see failure trends, eventually predict when assets were going to fail, and take the necessary steps to prevent failures, and disruptions to their operations. This approach helped the manufacturer to reduce unplanned downtime by 10%. While the centralized architecture has been enough for current enterprise systems, we now have an unprecedented amount of data coming in from a variety of sources. More and more manufacturers are trying to leverage data from new sources such as weather, traffic, social media, etc., and integrating these types of data into their supply chain and manufacturing operations requires real-time analysis in many cases. Given that, it might not be the best idea always to follow a centralized architecture approach. The data abundance scenario needs a decentralized, agile architecture that is more adaptive and responsive than a centralized architecture. In his research on Seven Lives of MOM, LNS Research Analyst Andrew Hughes has mentioned that future state of manufacturing operations management (MOM)/MES systems may be just MOM apps distributed on an IIoT platform. These applications, which can be run anywhere, have the capability to provide real-time insights from a variety of sources, answering questions we might not even have known to ask. While some of the most common use cases of Digital Twin can be found in the discrete manufacturing industry in the form of Digital Twin of the products manufactured, there are also substantial benefits in building a Digital Twin of a process or a plant. 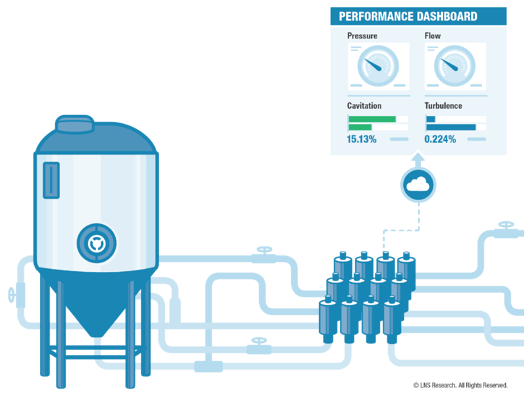 Process Digital Twins can be used to monitor process flows, simulate future work-flows to identify possible failures and prescribe possible countermeasures. Manufacturers can also take this one step forward and extend the Digital Twin to their supply chain. In doing this, the Digital Twin gets more potent with access to the supplier’s data. Several phone calls and emails to get information from suppliers one or two tiers away can be reduced to just a couple of clicks, saving companies valuable time. However, extending the Digital Twin model and sharing data with suppliers should also be accompanied by extreme cybersecurity measures. Our recent survey shows that 45% of manufacturers have begun working on their Industrial Transformation initiative. LNS recommends manufacturers should identify business cases that align with their strategic objectives before spending dollars on new technology. However, just implementing new technology is not enough. Applying new technology for current processes has limited benefits and is not part of a true Industrial Transformation. To reap the full benefits of Industrial Transformation, companies should launch new initiatives and evolve existing processes like change management to complement the digital tools. A recent LNS Research spotlight states that companies that have digitalized their continuous improvement (CI) initiatives are seeing three times faster improvement in their manufacturing cycle time. For manufacturers trying to gain such benefits, begin by investigating how existing processes can be digitalized, and then implement digital technology.